i had a post written out already but i cannot seem to find it. So i will tell you about the awesome baseball gam we went to instead. Andrea, Nancy, Angie, Maeve, Ethan, Paul, Will, and I all went to Aguadulce last thrusday for the Colce v. Herrera baseball game. Cocle is the province that we live in and apparently we are not too good so we were expecting to whooped by herrera who apparently wins like every year. We get into Aguadulce and get a couple of hotel rooms for the eight of us. four twin beds for the eight of us, you do the math. after we got our rooms we took a taxi over to the stadium, which was more like a little league baseball field with a bunch of grown men playing on it. we buy our tickets which were three dollars, outrageous i know. we find some seats and proceed to buy the best hotdog that you will ever have. they were huge first of all then they cover them in ketchup mustard mayo cheese and crunched up potato chips, all for $1.25. what could be better. i will tell you what could be better. cocle is rippin home runs right and left and we end up beating herrera 10 to 6. it was so awesome. we were just as into it as the fans. we all bought cocle bandanas. the band came and sat with us and they let us play the drums which was awesome. it was unlike any cards game that i have ever been to. we could not stop smiling or moving to the music. we are leaving for BOCAS on wendnesday!!! for five days for rest and relaxation. you should probably google it and be jealous. i reallly wish i would not have lost that blog post that i wrote earlier i dont really remember what it said, oh well. i will have plenty of stories for you all once i get back. which is in ten days by the way!! crazy. A little bit about what goes on around La MICA. Two of the most popular conversation topics are food and bathroom activity. When it comes to food we are either talking about the lack there of, how great something was, or how awful something was. Either all we do is sit around and eat non stop or there really is a lack of food. We haven’t really got that figured out yet. When I talk about something being really great to eat it is usually consists of a meal that has rice, beans/lentils, grilled cheese is always a huge hit, or like today we had pancakes and eggs for breakfast. Simply wonderful. The really only something awful that I think that we have had was some overcooked, under flavored spaghetti. Usually most things are bearable, but that was the one thing that I think every single person hated. Another hot food topic is about all of the wonderful from home that we miss oh so much. There has been a lot of talk lately about what will your first meal back be (which is something that I have already talked to my mom about). I have decided that it is going to be quite the hard choice to make. I want a meal that I love obviously, but I don’t want to have something that I love and have it make me sick and not be able to eat it ever again because of it. This has to be a very thought out decision as you can tell. The other hot topic, the bathroom, is always something that people are willing to talk about. We have come up with a handy way of addressing each other better know as jon names. These names have no meaning just a way of addressing one another while doing your business. All of the names are names of actors and actresses. We now call the two bathrooms Studio A and Studio B. Going to the bathroom has now become known as filming a movie. So say that for instance Andrea and me were going to the bathroom Tara Reid (her) and Bonnie Hunt (me) would be co starring in a movie. Its pretty funny actually but I realized that after typing this all out for others to read it does not sound very funny at all and it is something that people either don’t want to read or don’t care about but this is my blog and I will write what I choose. On the day to day. Usually most people are up and running around 7:00. This is not usually by choice. It is more like there are 20 other people up and moving around in this tiny room being loud so you might as well get up too. And if you wait too long to get up there is a good chance you might not get breakfast. My main motivation. Then after breakfast some people will head out to the park for their projects and everyone else just kind of sits around the table doing homework and reading and others go back to bed after being awake for a whole hour and a half. I am guilty of this some days. Then lunch will come. We eat again. Some of us will decide to go down to the rocks. This involves the intention of going down there to read and do homework but turns into laying out and napping in the sun. So we come back when we see that dinner is on its way in. Eat. Shower. More homework. Sleep. Repeat. Basically our days revolve around food, at least that is what it sounds like, and homework and projects in between. The sleep part of the night is one of the most interesting. I climb up into my bed try and wipe off most of the dirt off my feet. Get into bed and realize that my sheets are already coated in dirt from my feet (I brought white sheets, big mistake). Then I will lay there for a little bit either just listening to music or trying to read when really I am just looking at all of the bugs but outside and INSIDE my mosquito net. I have the top bunk right under the light. Perfect. I will usually lay there while I am trying to fall asleep just slapping myself trying to get bugs off of me. Tons of fun. I realized that after writing this blog post some of it sounds kind of negative but I really do love the time that I have here. We have a little over two weeks left now I think and I think that I am just getting anxious to go home, but I am not necessarily ready to leave La MICA. there are a lot of things that need fixing and improving, but we have adapted and learned to deal with them. Everyone is still in high spirits about everything from what I can see and I think that leaving is going to be hard for most people. 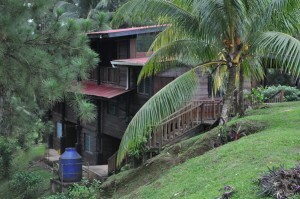 We will be happy to go home but there will be things about La MICA that we will miss. So I wrote this on the 22nd and a lot has happened since then……found out about 90 percent of my mosquitoes are not the correct Genus so I’m switching my project, went to El Valle, went to Aguadulce, went to the park a few times, laid on the rocks, went to Cano again, went to Panama again, got mugged, spent a morning at the hospitcal with Traci, and much more I’m sure, but I’ll write more about that later. I haven’t had a chance to make it to the internet for a while, so I think this blog is just going to be a bit of word vomit to try and fill those in at home of what I’ve been doing. I don’t even remember what the last thing I wrote about was, so I guess I’ll just start with Santa Marta. Santa Marta is a tiny community even farther up in the mountains than El Cope. I guess it was last week that we did homestays there for about 4 days, and I found myself wishing I had taken Spanish instead of French in high school. I was so jealous of everyone that could communicate with their host family and formed such a bond. Thankfully, Traci and I had Joy to translate for us, but I really wish I could’ve said and understood more for myself. We stayed with the local “doctor,” who is in fact some kind of health assistant and probably has about as much medical training as me. The family situation there was just awkward (I’ll explain more later). We did get to spend a morning observing at the clinic, which I found fascinating, depressing, and frustrating (again that’s all I’ll say about that for now). I couldn’t communicate directly with our mom much, but I could tell she is a strong and kind hearted woman. We were very glad to have the chance to help her in the kitchen to learn a few new things and just to feel useful. I was surprised to see her tear up the morning we left. I didn’t realize until how much the experience had meant to her. Our second day in Santa Marta was an all day hike to and from the spot where Torrijo’s plane crashed. I was definitely exhausted at the end of the day and didn’t want to see another hill for a long time, but it was an amazing experience. I even got to ride one of the horses for a while, which was quite thrilling. I was wondering how it is they make it over all the rocks and crevices when my horse was going up a muddy bank and fell on his front knees. I was halfway out of the saddle and ready to bail when he hopped back up. As great as the plane hike was and the day of two of the most amazing waterfalls I’ve ever seen, I think the highlight of the week was probably the dance. The last night we were there, the community had a party for us complete with a local band and dancing (including a duet of Joey and a Panamanian woman). After Santa Marta, I spent a few days at Cano and housesitting for Julie with Hanna. Cano was fantastic! I got swarmed by more mosquitoes than I’ve ever seen in one spot and Hanna got attacked by a huge nest of leaf cutter ants (see her blog for more details). I guess that really doesn’t sound fantastic, but I was really excited to catch 50 mosquitoes in one day and although I hate to see Hanna in pain it was kind of amusing to see her all the sudden freak out and start spraying her foot madly with the water hose. On a brighter note, I discovered I have a hidden knack for finding tiny beads in dirt and briefly considered switching career goals. I hear it is difficult to find a job in archeology though, so maybe I’ll stick with my current plans. I’m spending the rest of today and tomorrow at Julie’s with Traci since she can’t exactly hike to La Mica and Wednesday morning we leave for Bocas. I think that means I only have like two days left at La Mica……crazy! I can’t beliveve our time here is almost up. I miss home a bit, but I think I’ve thoroughly enjoyed the laidback lifestyle here. I don’t know if I’m quite ready to go back to the stress of my life back home. Maybe I’ll get a chance to blog in Bocas. If not, this is probably my last blog, so see you all back home soon! 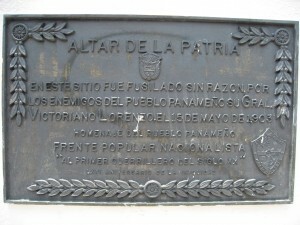 General Victoriano Lorenzo was shot on this spot on May 15, 1903 without any reason by enemies of the Panamanian people. I came into Panama City in an attempt to do a bit of research on Victoriano Lorenzo. The National Library, which is really quite a nice place to work, has 179 items in their catalog on Lorenzo. I spent the morning sorting through them, trying to find the most useful things to read. I’m really doing this backwards, because normally I would do this type of historiographic overview at home before coming on a research trip, and spend my time here looking for primary sources rather than trying to bring me up to speed on the issue. When I gave the librarian my book requests an older man next to me said in a very pronounced tone “Victoriano Lorenzo.” We started talking, and he said he was Harry Castro, a columnist for La Prensa. He said that Lorenzo was a bit of a complicated character, that he had killed people. He also said that he had pictures of Lorenzo’s execution. I asked the columnist what he thought of the General, and he was very noncommittal on the topic. Another way in which I am doing this project backwards is that I first went to the library to read books and then went to bookstores to buy them. I found a row of street stalls in Casco Antiguo selling used books, and asked one vendor if he had anything on Lorenzo. He said that it was very hard to find books on him. I asked why, and he said that Panama doesn’t value its history, and historians have largely ignored his importance. He started talking about how important Lorenzo was, how he was sold out by both the Liberals and Conservatives, and how he was always on the side of the poor. This, of course, is precisely the issue that interests me. Did Lorenzo have an ideology? Was he like Indigenous leaders in the Andes who made strategic alliances with the Liberals, only to be sold short when they were no longer beneficial to them? Or was he like Sandino in Nicaragua who was to the left of the Liberals (or, alternatively as his enemies claimed, nothing more than a common highway robber)? When I returned to the hotel after visiting the site at Plaza Francia where the government shot Lorenzo I walked up Ecuador Street right past a statue of Eloy Alfaro. 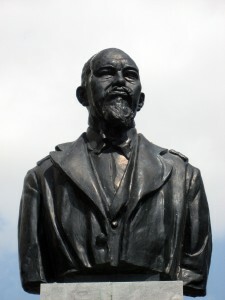 This old Liberal leader lived in Panama in the 1890s before returning to Ecuador and overthrowing the Conservative government (with Indigenous support) in 1895. I wonder if he had any contact with Lorenzo, either while he was here in Panama or after he took power in Ecuador. I wonder if Alfaro would have sold out Lorenzo. I found a couple books in the National Library and in the bookstores on labor movements in Panama. They talked about a huge strike at the Santa Rosa Sugar Refinery in 1965, culminating in a march to the capital to petition for their rights. We visited the refinery this last week as part of our class. Curiously, they said nothing during our tour or in their museum about this history of labor struggles at the refinery. The most important and interesting parts of history always get written out of the official versions. 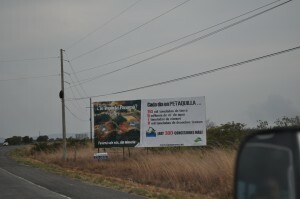 Here is the billboard we pass between Penonome and El Cope. The website listed on it is http://www.ciampanama.org/. I can´t believe it has already been 5 weeks. It seems like such a short time, but at the same time feels like forever. I like the relaxed atmosphere of being here, but at the same time I miss the stress of a packed full life and busy truman lifestyle!!! It is really cool to see and learn about different cultures like this but man it sure does help me embrace my own! I am so ready for a driveway and a mailbox. Mom was right there is a lot more in my life that I could stop taking for granted! Like toilet paper! This week we took two awesome day trips- one to El Valle and the other to Aguadulce! In El Valle we went to a rescue and rehabilitation center for the amphibians that are dying off due to Chytrid fungus! It was so sad to know that they are barely hanging on to existance and that the only way for them to do that is by living behind class walls. 🙁 They are doing a great thing taking care of the amphibians, but man I be it would be so nice to see them reintroduced in the distant future! In Aguadulce we were able to go to a sugar cane refinery! It was so awesome to be inside the factory so close to the machinery! It was so hot, around every corner I felt like the machines were breathing on me! Got lots of good pictures and hope to take more tonight at the all inclusive 😉 24 hours in a resort with a water heater will be a luxory! Love my family 🙂 Miss you all tons! hello all. not to sure what to say in this one. not too much has been going on. im sure that there are a lot of things that i can tell you about but as usual i am short on time. i guess the thing that i am most excited about is that on the 31st me and some other girls are going to Bocas del Toro for a little get away. basically a tourist beach. four days of doing absolutely nothing sounds alright to me. other than that there has been a lot of talk around camp about things/food that people are craving from home. it keeps getting more and more intense becasue home is getting closer and closer. the conversations usually end in someone saying shut the hell up you are making me hungry. something along those lines. speaking of food i am going to go grab some lunch now. seeeee yaa!!! 2 WEEKS LEFT!!! get ready for me!! 1. Going to the rocks. A little ways down from La Mica there are rocks in the sun along the river, I like to go there and relax in the sun with or book or my iPod. Life´s rough. 2. Taking naps, very enjoyable because we wake up so early here. Afternoon naps aren’t the best though because its hot and you wake up in pools of sweat… yum. 3. Hiking. Yesterday I climbed the mountain behind La Mica, there was beautiful views from up there. 4. Class. We do actually have class which usually consists of open discussions. I don’t have a lot more to say about this because class is class. 5. Talent show and birthday parties. We had a birthday party last Friday night and everyone certainly enjoyed themselves. We even had a piñata. Next weekend we have a talent show planned even though no one has any real talents that I´ve heard of. Some options I have been given so far is touching my tongue to my nose, doing the cyclone with Kelly, or blowing a snot rocket in unison with Paul’s fart. That’s talent for ya. Other talents I´ve heard of are getting low and reading excerpts from a self written trashy romance novel. Should be interesting. 6. Going to the park. I usually go at night because that’s when I can work on my project. It’s a little scary in a jungle at night but I´m getting used to it. Lions and tigers and bears Oh My! 7. Jon names. We all have been given celebrity “Jon names” which we use when were going to the bathroom (which we call the studio). We film movies down there, I´m Tara Reed. Don’t ask. 8. Bocas del Toro. I´m planning to use up my remaining free days on a trip to the islands of Bocas del Toro. I´m hoping to learn how to surf. Sand and sun here I come! 9. My future. The other night Angie, Nancy, Kelly, and I discussed our futures and we all have no idea what to do. Suggestions are welcome. 10. I can´t think of a ten but I hate to leave it at nine. I miss everyone and am excited to return. Peace. We woke up at 4:30 Tuesday morning to go visit the shaman in Coclecito. I’m not entirely sure why I’ve been invited on this trip, especially since I tend to have a rather materialist view on life. The shaman invites me to sit down with him, and between my strong accent in Spanish and his hearing loss it turns into a very frustrating conversation. He tells me of how he was driven out of El Cope as a witch doctor, and how he has acquired an extensive knowledge of medicinal plants. On the way here we passed the Petaquilla mine. As seemingly is the case throughout the Americas, a Canadian company is working the mine. 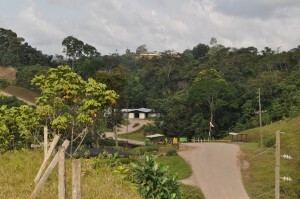 Similar to Guatemala, El Salvador, Ecuador, and elsewhere, the mine has triggered a lot of local opposition. This is, of course, a topic that deeply interests me because it engages issues of social movement organizing. I wish I had contacts with organized opposition to the mine, if indeed it exists. Last May when we were here a newspaper article talked about local groups closing the road to the mine. But now all I hear are random individual stories of peoples’ experiences with the mining company. As an academic topic in an interdisciplinary class, it seems like studying the mine would open up a lot of possibilities. Such an investigation would bridge issues of environmental conservation, the economics of international finance, histories of resource extraction, studies of labor legislation, the politics of treaty negotiations, etc. But, unfortunately, I don’t have the contacts to make such a study viable, and I’m not sure how much interest the students would have in studying the mine anyway. Too bad. One the way back from the shaman we stopped in the small town of Coclecito to visit Omar Torrijos’ house. Torrijos was headed to his hideaway here in the mountains when his plane crashed at Santa Marta in 1981. In her autobiography The Country Under My Skin, Gioconda Belli talks about how Torrijos tried to take her to this house. Relatively speaking, the house was not that large and had very much of a 1970s dark wood feeling. According to the guide, Torrijos first came to Coclecito in 1970 after a flood washed away the houses of a couple local inhabitants and they wrote to the General for help. He apparently fell in love with the place, and provided the local peasants with a lot of material support, building the town in the process. Seeing the house provided an interesting view into the life of the most famous of the Panamanian leaders. Sorry about the time, it’s been a ridiculously long time since I last posted anything. We are now halfway through our trip and a lot has happened since my last post. Our trip to the San Blas islands was amazing, the island we stayed on looked like something off a postcard; beautiful white sand, clear blue water, and palm trees. Although I, along with basically all my classmates, got burnt I loved staying on the beach for a few days and playing in the sand and water. The best part of the trip though was definitely visting the Kuna on Carti island, being there for their independence day celebration was an amazing experience. The first day we went to the island to visit the Kuna congress where they welcomed us to their islands and then we went to a museum where I learned about traditional Kuna life. The celebrations started the next day with reenactments of their revolution that lasted the entire day. I was surprised by how well rehearsed they were and the extent of their props which included fake guns that fired and fake blood. Chris unexpectedly got to take part in the reenactments, portraying the american Richard Marsh who played a role in the Kuna gaining their independence. The next day, the actual day of their independence, began with more reenactments and then around noon the men and women convened in their ceremonial building. Inside, the Kuna men and women seperated to each side and began their ceremonies which was centered around drinking cheecha fuerte. Being able to participate in these ceremonies was one of the coolest experiences of my life. It rained basically all night and due to the flooding of almost all of our tents we were tired and ready to go back to La MICA the next morning. After being at La MICA for a few days a group of us headed to Boquete for our free days. Getting there entailed riding public transportation for the first time. Going from El Cope to the Entrada went smoothly, however, once at the Entrada we had to wait about 3 hours for a bus that wasn’t completely full. When we got on that bus (which was a giant double-decker) we unexpectedly found Paul, Ethan, and Cameron. We took that bus to David, the provincial capital of Chiriqui, were we found out at the bus terminal that the last bus for Boquete had already left. After almost getting royally ripped off we found a bus driver that would take us to Boquete for a reasonable price. Once we finally got there we checked into Hostel Mamallena. We were surprised to find out that basically everyone at the hostel spoke English and that there were people there from all over the world. It was very weird to hear more English spoken than Spanish for the next couple of days and I felt like I had left Panama and gone to a small mountain town in Colorado. Our first day there we decided to go to the hot springs which was a short bus ride away from Boquete. The hike was supossed to be a short 10-15 minute hike from where the bus dropped us off, however, we ended up hiking for at least an hour thoroughly unprepared wearing flip flops without seeing the hot springs. Turns out we had passed it about 10 minutes into our hike, Panama does not have signs everywhere like in the United States. Since our bus was going to be back to pick us up soon we decided to just play in the river where the buss dropped us off for a while. It was fun even though we didn’t get to go the hot springs and the hike was absolutely beautiful. That night we went out to a middle eastren restaurant; I found it strange that my first time eating middle eastren food was in Panama. The next day we did a zip line canopy tour. Although this was definitely a very touristy thing to do I had a blast and was pleasantly surprised by how fast you go on zip lines and all the guides that went with us were extremely nice and fun. That night we ate some delcious pizza and walked around Boquete. We left early the next morning and although it was nice to be able to understand everyone for a while, I was ready to leave this weird touristy place and go back to the campo. Next up, our homestay trip to Santa Marta.